Just over a year ago, the project @RealTimeWW1 started to tweet about these kind of historical events and developments related to the Great War of 1914-1918. Masters students in European Contemporary History at the University of Luxembourg made it their task to give an impression of both general changes and personal stories that happened exactly 100 years ago (see more at: http://ww1centenary.oucs.ox.ac.uk/teaching/every-day-another-history/) Currently, the number of followers has climbed to almost 9000, with new people joining every day. However, this success story has not been without its challenges. For example, the database where future tweets are saved and then sent at a determined day and hour, has sometimes incurred a few mistakes which went unnoticed by the supervisory team. In one instance, a student tweeted about how a general, with a seemingly German name, promised his troops to be in Berlin at Christmas 1914. In actual fact, the general was Russian which lead to a whole new set of connotations and meant that corrections were needed! There are also a number of temptations associated with the project which those involved have to be mindful of. One of the biggest being the temptation to tweet something only to attract a high numbers of clicks, re-tweets and new followers, positioning the content as second priority. Another temptation that strongly goes against the real-time principle of the project is to explain why a particular event is of key relevance: be it a final battle at one front, the highest number of casualties in the entire war or the last election that happens until the truce of 1918. The main idea behind @RealTimeWW1 is to offer its followers an impression of how people perceived the everyday life of war exactly 100 years ago. 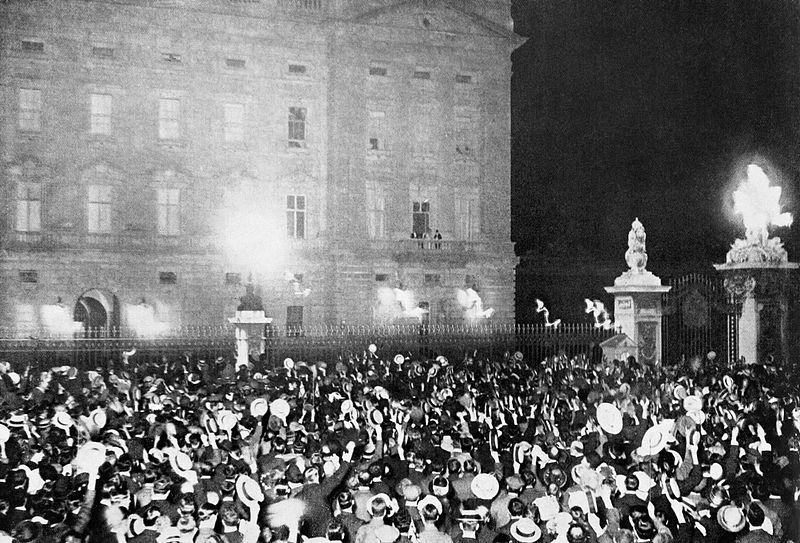 Events that are seen as crucial for the further development of the war today may for the people in 1915 just have been another war headline in the newspaper, just another battle that is lost or just some land that is given up but will surely be conquered again soon. Only it won’t. However, although problems can arise – both technical and content-focused-none of them fundamentally endanger the project. After all, it is and remains an experiment: a work in progress led by students rather than professionals. The project evolves in exciting new ways constantly informed by its contact with the public – including the dialogues that start with the discussion over a mistake. This on-going work has led to some tangible outcomes already. The abovementioned database is now able to safely store and send, pictures, which was not possible in the beginning and the number of tweets contributed by the students has risen. The supervisory team has established a daily routine of controlling and filling potential gaps. Thus, not only is there a frequent flow of WW1 news – the project has also achieved a balanced representation of fronts, countries and groups of people in the stories that are told: a mix of politics, economics and culture, of everyday life at the front and at home, of decision-makers and ‘simple folks’. 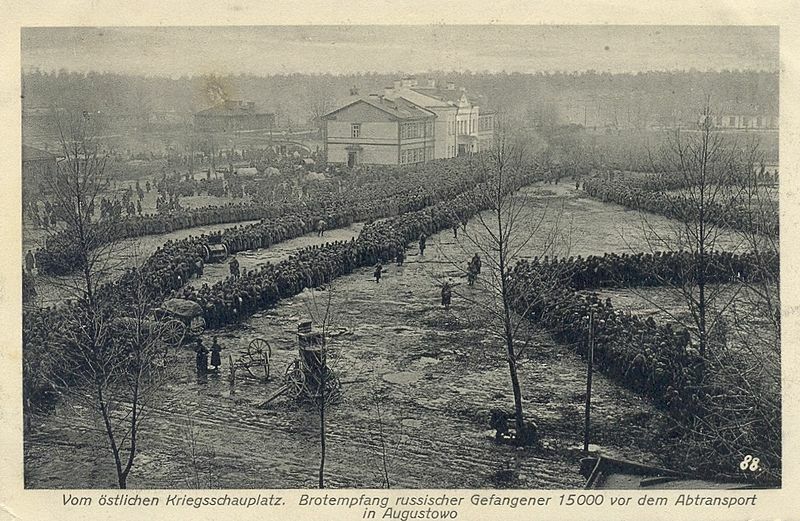 … to thousands of prisoners of war (here: Russian soldiers, taken by Germans after the Second Battle of the Masurian Lakes in February 1915): events of WW1, tweeted in real time. The interaction with followers is very enriching. A constant exchange with the project’s public has developed, though obviously all connected to the war events and developments. People ask for clarification, post additional information, draw lines to today’s world, in which some developments seem to be so very similar to the situation 100 years ago e.g. the Ukraine crisis has been mentioned several times and the Cholera epidemic of 1914 has sometimes been compared to the Ebola outbreak. While this exchange has mostly been with non-academics, there has also been significant interest among the academic community surrounding the project’s Digital Humanities background, the pedagogy of teaching with such a format and, the benefits and limitations of publishing on a scientific level in social media with a mere 140 signs. To maintain and increase this exchange is one aim of the coming years – next to the simple, but ever challenging ambition of continuing to tell the stories of the people living in times of the Great War in real time, only 100 years later. This entry was posted in Consent, Dissent and Revolution, From Space to Place, Teaching and tagged International conflict, Social Media, Teaching, ww1. Bookmark the permalink.